A-ICE participates to the TIDE Sprint which takes place in Virginia Beach, USA, taking forward much of the work tackled at the previous NATO Hackathon held in London, UK (27-31 March) and the TIDE Sprint held in St Malo, France (3-7 April 2017). Tide Sprint is a forum for C4ISR scientists, engineers, managers. In addition to operators from National Governments, Military, Industry and Academia. These will collaborate, exchange ideas and innovate to reach common solutions to many of the most pressing interoperability challenges faced by NATO. Tide Sprint will explore outcomes from the Coalition Warrior eXploration, eXperimentation, eXploration and eXercise (CWIX) event which experimented with and tested interoperability between deployable CIS from Alliance and Partner Nations. 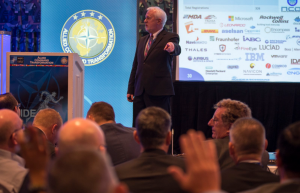 By bringing together these events, ACT paves the way for a more innovative approach to interoperability within the NATO federation to persistently connect forces by identifying and solving these pressing interoperability problems more efficiently. A-ICE is part of the very few worldwide industry companies who have been elected as contributors in the Logistic Track, with the purpose of discussing the potentials of emerging technologies for future NATO logistics capabilities and Sustainment Concept. In particular A-ICE contributes with its knowledge in military intermodal logistic transportation and related Modelling and Simulation. Participants develop military concepts, specifications, roadmaps and requirements that will support and contribute to the Federated Mission Networking initiative to develop ‘day zero’ interoperability and improve operational resilience of NATOs command and control systems. This entry was posted in Events, Military Solutions, News and tagged A-ICE, CLOS, Logistics, M&S, TIDE Sprint. Bookmark the permalink.